When the Neil Young Tribute Band first started, my only electric guitar was a Music Man EVH, just about the most un-“Neil Young” guitar there is ! Not able to afford a ’53 Les Paul or a Gretsch White Falcon, I set out looking for a cheap alternative that could look and sound the part, I like a challenge! East coast Music sold me a De-Armond M75, after letting me play all 15 they had in stock, the one I chose was black with a Bigsby style trem and De-Armond pickups, I couldn’t believe the value for money at £175. The first modifications were purely cosmetic,I made a brass pickguard and control plates,then fitted them with a Les Paul Rhythm Treble switch plate. This guitar was then simply plugged into my existing setup, a Galien Kreuger 250ML amp (providing distortion and feedback only) into a Fender ’63 re-issue Reverb and finally my regular amp, a 1959 Teed Fender Tremolux. As the shows got bigger, I added an ancient Dod Octave pedal,which is noisy and unreliable, it doesn’t bypass properly and often gets the notes it’s supposed to be octaving wrong! I’m sure “Neil” would love it like I do, I’ve re wired it a couple of times when it’s fallen apart ! Next I added a Boss Flanger, which I always use when I’m playing rhythm on “Like a Hurricane”. Sometimes my little amp has trouble keeping up with Mark’s Boogie, so I have an A/B/Y box, which splits the signal into a second amp, usually a 1969 Marshall combo, or occasionally my 1972 Hiwatt 100. After roadtesting the guitar, I decided it sounded a little thin,so I changed the single coil pickups, first the rear one, for a Brandoni Firebird, (incredible quality for £40!). This so impressed me, that I later changed the front pickup for a Brandoni Filtertron. They’ve been in there ever since as they sound great. I later changed the bridge (the original,I thought was too high-tech, with roller saddles, not at all “Neil”), the replacement is a solid cast Bigsby, which seems to add tone, I also changed the trem for an original US Bigsby which, although no better, looks more the part! All the changes cost around £150. 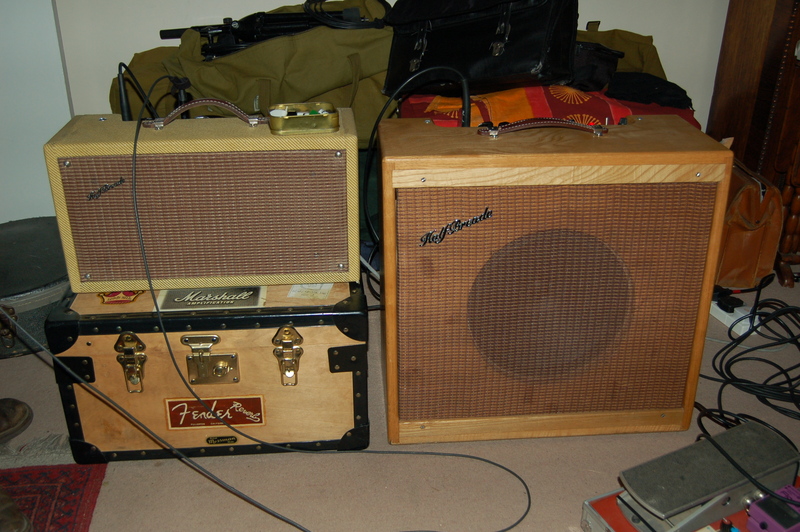 My amp, I later found out, is pretty close to Neils, his being a 1959 Tweed Delux. Some friends and I built copies of it to try and preserve the original; they’re called “Half Breades”! They sound pretty close but even louder,I often use my old amp for smaller venues though. The main output valves are Westinghouse 6V6 and the pre-amp valves, good old Mullards. I’m constantly fiddling with the setup, I’ve recently built a valve reverb unit, (Mark now has the Fender re-issue). The output valve is an Adzam 6K6, which I’ve discovered makes a BIG difference. The GK 250ML has now been replaced with a home made pedal board, containing, in this order, the Dod Octaver (for “Hey Hey, My My”), a home made valve pre-amp (on all the time! ), a Marshall Guv’nor II, Boss NS2 (needed with all these valves! ), Boss Flanger and an Ernie Ball Volume pedal. The reverb is always first in the chain, before the pedals, to get that authentic,”Live Rust” sound. The GK 250ML is always still around as backup, however. If you ever catch me playing with my other band, Colour Radio, I’ll be playing one of two Telecasters, a Fender ’52 re-issue, or a home made one with a rosewood fingerboard, my first guitar was a Tele, so I keep going back to them. That’s it so far, the other stuff never changes, a 1972 Matin D18 acoustic, 1917 Savana Banjo mandolin (£5 from a car boot sale, in bits, so I re-built it! ), Marine Band harmonicas and Herco Flex50 picks. 0 comments By Mark on July 25th, 2008 @ 9:17 am.